Caffeine is ergogenic after supplementation of oral creatine monohydrate. As indicated by a greater T(lim), acute caffeine ingestion was found to be ergogenic after 6-d of creatine supplementation and caffeine abstinence. These findings suggest that the acute ingestion of this preexercise supplement may be an effective strategy for improving anaerobic performance, but appears to have no effect on aerobic power. The effects of a pre-workout supplement containing caffeine, creatine, and amino acids during three weeks of high-intensity exercise on aerobic and anaerobic performance. These results demonstrated improvements in VO2max, CV, and LBM when GT is combined with HIIT. Three weeks of HIIT alone also augmented anaerobic running performance, VO2max and body composition. Ingesting a pre-workout supplement containing caffeine, B-vitamins, amino acids, creatine, and beta-alanine before exercise delays fatigue while improving reaction time and muscular endurance. Ingesting the SUP before exercise significantly improved agility choice reaction performance and lower body muscular endurance, while increasing perceived energy and reducing subjective fatigue. These findings suggest that the SUP may delay fatigue during strenuous exercise. 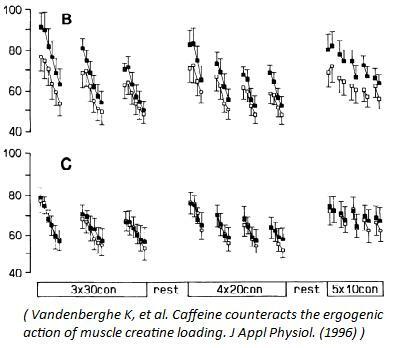 Caffeine counteracts the ergogenic action of muscle creatine loading. The data show that Cr supplementation elevates muscle PCr concentration and markedly improves performance during intense intermittent exercise. This ergogenic effect, however, is completely eliminated by caffeine intake. Caffeine and Progression of Parkinson Disease: A Deleterious Interaction With Creatine. This is the largest and longest study conducted to date that addresses the association of caffeine with the rate of progression of PD. These data indicate a potentially deleterious interaction between caffeine and creatine with respect to the rate of progression of PD.